Oh boy! Have I been silent for so long? Well, I have a good excuse. Since March 26th, I’m on a break. After a gruelling 14-hour day, I arrived to my parents’ apartment in Buenos Aires and I’ve been resting ever since, gathering energies for the next part of my voyage: riding all the way to North America (voluntary vagueness here, don’t know if I’ll end in Southern Mexico or in Eastern Canada). Meanwhile, a quick flashback. While I was in Thailand, I stopped for a few days at that awesome biker’s place called the Rider’s Corner in Chiang Mai, managed by Phil Gibbins (KTMphil, moderator at rideasia.net) and his wife Som, they offer cozy rooms, great Thai and Western food and a great place to meet other riders. One afternoon, I came back and Phil introduced me to motorcycle legend Dr. Greg W. Frazier, a man who has circled the globe on a motorcycle four times by himself and a fifth one carrying a blind woman on his bike. He told me he was profiling motorcycle travellers for an article and he interviewed me and took some pictures the next day. Here’s the article: Dr. Frazier: Profiles of Adventure Travelers. Most of what he says about me is slightly inaccurate but having seen his handwriting while he was taking notes, I can’t blame him. Plus, it’s an interesting read. Enjoy! I’ll resume normal posting when I’m on the road again. Hey, so you have to return to France and bank more funds before continuing your trip in south america! btw, what’s the feeling of having a “normal life” and eating “normal food” at home after 9 months of adventurous travelling on a motor bike?? I dunno…Your mum’s food !? dulce de leche ? empanadas ? You deserve a rest. Good luck with your plans to travel North America. If you find yourself in Ottawa Canada you can use my guest room. 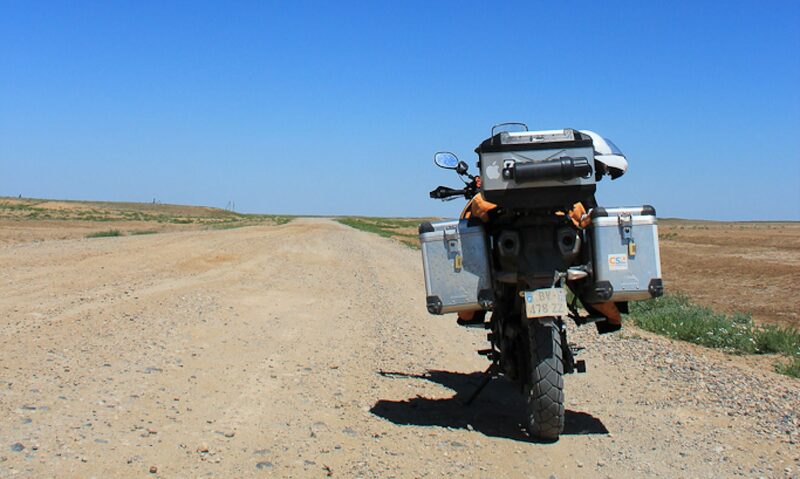 What kind of preparations will you make for the bike before you begin your journey? I won’t be making any special preparations, I’ll just be giving the bike some well-deserved maintenance: oil change, new chain set, new cush drive, straighten a bit the front (smashed in the jungle in Thailand) and maybe get a new topcase.